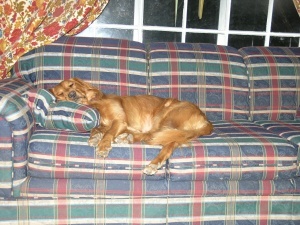 We had lost Flame in March of 2005, so the house was very quiet. I was going on business trips and we did not have any kids in the house. 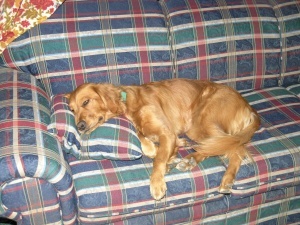 My wife said one evening that she would like another dog to break the silence. I had a midnight conference call that evening, so while on the call I went on Craig’s list. I never went on Craig’s list before. 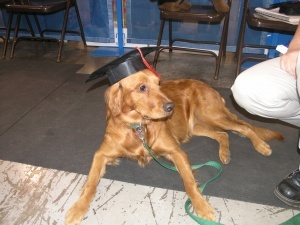 But there was a Golden Retriever being offered for adoption by a family in Portland. So I sent the e-mail at midnight to inquire about her. My wife received a phone call the next morning from a women stating if we were still interested in Cinnamon. I had already left for work and did not tell Cynthia about this dog. So it was a bit of a surprise to Cyn. Cinnamon was living with a family with an autistic child. 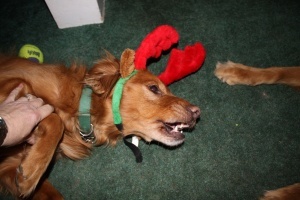 Cinnamon was a bit crazy dog. The two would feed off each other, which did not make for a great situation. So we adopted Cinnamon. Cinnamon had 3 distinct personalities, Cinna-Monster, Cinnamon & Cinnamon-pie. The Monster would run around the yard like a crazy girl for hours sometimes. 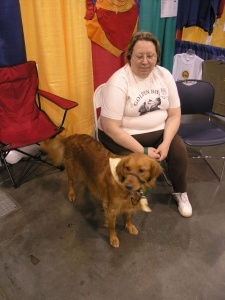 Cinnamon did normal dog items, and Cinnamon-pie was the cute, calm loving one. 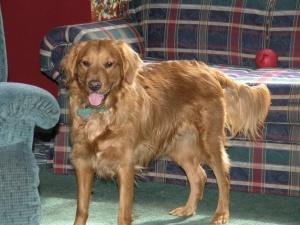 Cinnamon was not afraid of anything, she would open doors and destroy stuffed animals. But she was very afraid of fireworks and gun shots. She would just shake all over and wander around like a zombie. Since out neighborhood tends to be a “war zone” over July 4th, we made it a habit to get out of town and stay in hotels in quiet zones or where the fire danger was so high nobody dared to use fireworks. Cinnamon’s favorite activities was chasing after water from sprinklers or hoses. She loved chasing after “red dot” (laser pointer) and destroying stuffed toys to make “snow”. And just like any Golden, she loved going for car rides. Cinnamon as crazy as she was, was a very smart dog. 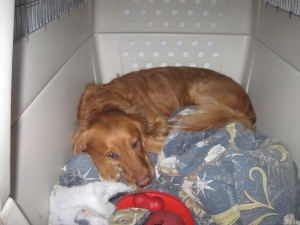 She also worked with 8 foster dogs from Golden Bond Rescue. Each one she worked with, and had a lot of fun. She learned from each one of them as well as she taught them. She was a great foster sister. There was only one foster dog that did not work out with Cinnamon (Maggie). When we adopted our 9th foster dog, Nikki, Cinnamon was so happy to have an older “mamma” dog. Nikki helped Cinnamon during fireworks to calm down. 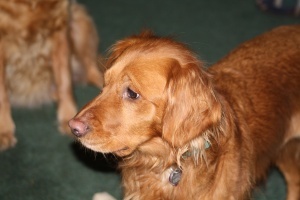 When Nikki moved to the Rainbow Bridge, Cinnamon went into a severe depression. So we adopted Rusty which Cinnamon adored. 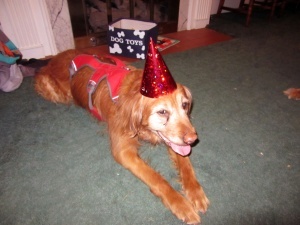 When Cinnamon turned 11, she started slowing down with her rear legs getting weak. Then she lost all control of her rear legs. We opted to have a MRI/Catscan. They found she had one damaged spinal disk, and 2 bulging/slipped disks. She was put on pain medicine, which miraculously enable her to start walking again. 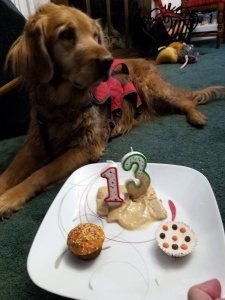 She celebrated her 13th birthday in August, 2017, but her age was catching up to her with her really slowing down. She also hated taking her medication. When Rusty’s condition got to the point that it was time for him to cross the Rainbow Bridge, we made the decision that it was Cinnamon’s time as well due to her condition, as well as she would have been heart broken losing Rusty and would have declined even faster. It was a hard decision, but the right one.